The International Space Station streaks across the sky as the full moon glows over Half Dome Yosemite National Park in this image. 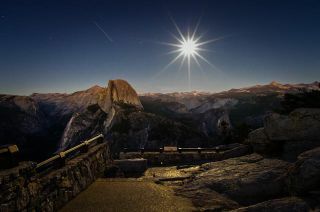 Scott McGuire captured this image on Oct. 28, 2012 from Glacier Point in Yosemite National Park, California. He used a Pentax K-5 camera and a Pentax 15mm Limited lens to capture the photo. "I was at Glacier Point to photograph the sunset and full moon, the International Space Station was an unexpected bonus," McGuire wrote SPACE.com in an email. Half Dome is a large peak rising 5,000 miles above Yosemite Valley. The steep, granite mountain is one of the most popular hikes in Yosemite National Park. With a wingspan as long as a football field, the International Space Station is the largest human-made structure in space. The spacecraft is home to six astronauts representing the United States, Russia and Canada, and has the same living space as a five-bedroom home. The space station can be easily seen from Earth by the unaided eye, if you know where and when to look. At times, it can even rival Venus, the brightest planet in the night sky, with its intensity. NASA recently launched a new Spot the Station website that allows stargazers to sign up for text messages to learn when the orbiting laboratory will be flying over their location.